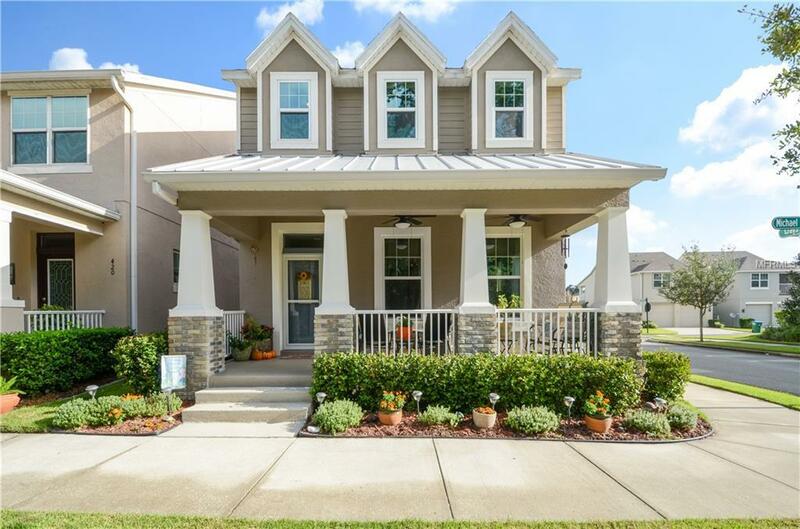 Like new, must see home in the ever so sought after community of Winter Springs Village. This home is actually "better" than new because of the additional details and the level of care that is reflected in the pride of ownership. The expansive front porch greets you each day and is the perfect setting to relax and take in the private wooded view. Upon entry, the open concept is so welcoming and offers an ideal space for gatherings or entertaining. No detail has been overlooked. The kitchen features beautiful espresso cabinets with crown molding, quartz countertops, subway tile backsplash and very gently used Stainless Steel appliances. You cannot miss the stylish light fixtures in the kitchen and dining room along with a beautiful custom built-in hutch for additional storage in the dining room. Notice the the crown molding throughout and the custom window treatments that tie the space together. Upstairs the details continue with crown molding and custom made cushions for the window seats in the loft. The master bath and secondary bath upstairs both include the rich espresso cabinets with quartz countertops. The master suite offers plenty of storage with a custom built-in walk in closet system and the other closet being used for an office space. We cannot neglect the creative way in which a portion of the garage is being used for a play space - just perfect! The exterior of the home has recently been painted and the a/c has been replaced as well. PRIME LOCATION * LOCAL ENTERTAINMENT * AMENITIES * VALUE! Additional Lease Restrictions Buyer To Contact Hoa For Leasing Restrictions. Pet Restrictions Buyer To Contact Hoa For Pet Restrictions. Listing provided courtesy of Mainframe Real Estate.